The 888 Poker points scheme is one of the best in the industry, offering great prizes, rewards and up to 36% cash back. It is designed as a loyalty scheme and rewards your continued play at the 888 poker tables and gives you an incentive to earn bigger and better rewards. Although the levels can appear a little complex at first glance, it’s actually quite a simple system, but it’s important that you understand the system so that you can ensure you are making the most of it, and getting the biggest return for your valuable time spent playing at the tables. 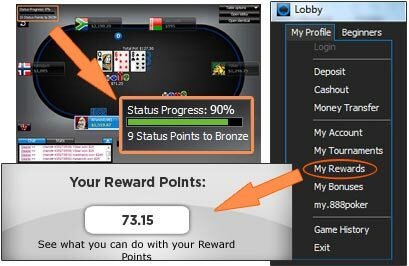 888 Poker Loyalty Scheme: How does it Work? 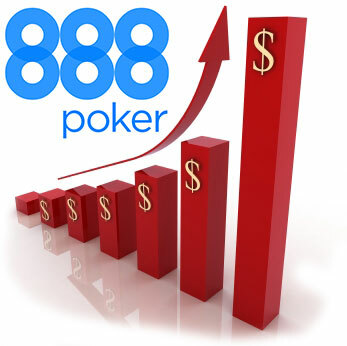 Once you start playing at 888 Poker for real money, you’ll also start to earn VIP points call Status points. These will help you to climb one of the 8 monthly or 2 yearly status levels, that are offered by the VIP club. As with all VIP programs – the higher your status is, the better your rewards will be. While all the players are rewarded for their play, those who show loyalty and put in effort, will get higher rewards. Status Points (SPs) – These points define your status level, the more points you earn the higher your status level will be. With a higher status level you will earn a higher ratio of Reward Points per single Status Point. Rewards Points – these are the actual points that you get prizes, gifts and cash back for. On the lower status levels you will get 1 reward point for each Status Point earned, at the highest level you will get 18 points per single Status Point earned. A team of dedicated VIP managers look after you as you progress through the VIP levels and earn a higher player status. Status points are earned every time you sit down and play at any poker table. This includes cash game tables, tournaments and sit and go tournaments. In fact join any table where you are playing for real money and you’ll automatically earn Status Points. Contributed Rake is used as the basis for calculating your SPs and refers to the fee that is deducted from each pot by the poker room. It is usually around 5% of the pot up to a maximum of a few dollars, but will vary depending on the stake level you are playing and the number of players at the table. The total rake deducted is split across all players involved in the pot and so your contributed rake is your allocated proportion. The simple way of calculating this is based on the total pot and the amount you contributed to that pot. so if the total pot is $100 and you put in $25 of that, then your contribution is 25%. There are a total of 10 status levels. 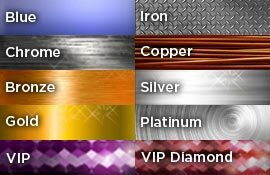 The first 8 of these levels, Blue, Iron, Chrome, Copper, Bronze, Silver, Gold and Platinum are earned by achieving a set number of status points in a month. Once you have reached the required number of points for a status level you will immediately be promoted to that level for the rest of the current month and the entire of the following month. The top 2 status levels, VIP and VIP Diamond are earned based on an annual status points target and once earned you will keep that status for an entire year. The rewards on these top levels are truly exclusive and bring with them the finest rewards in online poker industry. Blue is the very first level of the program, which is awarded once you join the site and start playing for real money. On top of the regular deposit bonus and promotions, you’ll also receive 1 Reward Point per Status Point and 2% cash-back. Nothing outstanding, but hey, you are just getting started! Iron is the second level in the program and requires 10 Status Points in order to be awarded. As an Iron VIP, you’ll still get the 2% cash-back on top of other promotions. However, you’ll also be able to participate in a $100 daily free-roll. While they are nothing special, if you are just starting out, these might give a great boost to your poker bankroll. Chrome is the third level in the program and requires 25 Status Points in order to be awarded. Chrome VIPs enjoy the same benefits as Iron ones, but there’s one extra daily free-roll. You’ll be able to participate in a $200 daily free-roll. Copper is the fourth level in the program and requires 50 Status Points in order to be awarded. Copper level holders get the same benefits as Chrome ones, but again, one extra free-roll is available for playing. You’ll be able to participate in the $300 daily free-roll. Bronze is the fifth level in the program and requires 100 Status points in order to be awarded. While main benefits remain the same as they are for lower levels, there’s one extra tournaments again. You’ll get a token to a weekly $750 free-roll. Silver is the sixth level in the program and requires 500 status points. As a Silver status holder you’ll enjoy an increase in reward points and cash-back percentage at 4%. You’ll also be awarded with an entry to $1,000 weekly free-roll. Gold is the seventh level in the program and requires 1,500 Status Points to be achieved. Gold level holders are enjoying a significant jump in terms of cash-back – 9%. There’s also an exclusive $4,000 monthly free-roll for holders of this status. Platinum is the eight and highest monthly status in the program. You’ll need to earn 4,500 Status Points to become one. However, it’s definitely worth it, as Platinum level features a cash-back rate of 18%. You’ll also have access to all free-roll tournaments running, including the monthly $7,000 free-roll, where serious cash can be won even if you are a regular player. VIP is the name for the first of two yearly levels in the program. Earn 60,000 Status Points in a calendar year and make yourself comfortable, as this status brings in some fine benefits. VIP level holders enjoy $64,000 in monthly free-rolls! This includes the monthly $10,000 VIP free-roll, which gets a relatively low amount of entrants, providing great value. There’s also 27% cash-back, which is a huge jump, when comparing to the previous levels. VIP Diamond is the top of 888’s VIP program. If you’ve reached this status, there’s a reason to feel special. There are only a handful of players, holding this status every year. Reaching it also pretty much guarantees the highest rewards in online poker and the VIP team will treat you like a King. Not only you’ll get rewarded with cash from the 36% cash-back, but you’ll be treated as a true VIP at 888 events. Yes, there really are many events, as 888 is a major sports-book. Status point reset each month, although still contribute to the annual target for the top two status levels. Reward Points on the other hand are never lost and can be used to get rewards from the VIP program. Gifts and Goodies – you can use your accumulated reward points to exchange for all sorts of cool items in the Online Shop. Exchange for 888 branded gear, high value electronic items, designer products, luxury holidays and much more. Cashback – you can convert your reward points into real cash at any point. Just exchange your points via the “My Profile” section in the main lobby and the cash will appear directly in your poker bankroll immediately. Freerolls & Tournaments – There are daily, weekly and monthly freerolls available to VIP members where you can participate to win real cash prizes. 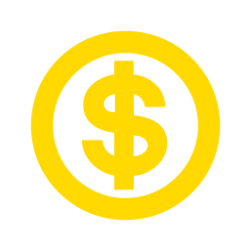 Freerolls vary in value from $100 up to $64,000. You can also participate in special status level tournament where you can win upgrades to higher status levels instantly. There is no end to the value you can get from the 888 poker reward points program. The first few status levels are very easy to achieve and give you a good return for your time. If you manage to achieve the higher levels then you will be receiving amongst the best loyalty schemes in the industry. So what are you waiting for, get started today by clicking the box below to download & get started.